The 2012-13 Dallas Children's Theater Season is no longer available online. To buy a package and take advantage of great savings available only to season subscribers, call the box office. Deck the halls. First graders Junie B., Herb, José and the gang are back! Based on the wildly popular book series by Barbara Park, see the world thru the eyes of a sassy and impulsive first grader and her schoolmates in this laugh-out-loud holiday production. It’s Merry Mayhem filled with Junie B. joy and glee. 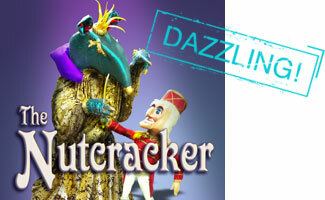 Tchaikovsky's holiday masterpiece magically brought to life with dazzling puppetry. Kathy Burks & Company revive their critically acclaimed staging for the intimate Studio Theater. Guaranteed to sell-out. One of the most cherished and beloved books of all time! Savor the whimsical and rich world of a child’s imagination with stars, air and noises everywhere! This fanciful poem of goodnight wishes comes to life as an extravaganza of enchantment, singing, dancing and puppetry. Kathy Burks & Company brings this delightful Brothers Grimm tale to life and spins pure GOLD! They’ll all live happily ever after… if the miller’s daughter can only remember that strange little man’s name! It’s the 50th Anniversary of this Newbery Medal winning, sci-fi classic. Sister Meg, her little brother Charles and Calvin—the most popular boy in school—are on a dangerous mission to rescue Meg’s father from another planet, and save the universe. An extraordinary, extra-terrestrial adventure across space and time. The Regional Premiere of this new, highly theatrical adaptation. You know this guy. Stanley Lambchop is just like everyone else, but one night he makes a wish… and it comes true! In a whirlwind musical travelogue, Stanley - the ultimate exchange student—scours the globe to do something the world has never seen before, and learns that heroes come in all shapes and sizes. Adapted from the hilariously popular book by Jon Scieszka & Lane Smith. A. Wolf finally gets to tell his side of the story and YOU determine the ending of the play in this rock Hip-Hop-ity musical that will blow the hair off your chinny chin chin! Hot off its acclaimed national tour. These performances are not part of a season package, but you will be able to buy single tickets at a special discounted rate. It’s Friday in the life of 8 young people as they navigate the rough waters of high school. Experience this high-energy new musical thru songs, humor, and real-life situations interwoven with the latest discoveries about the mysterious teen brain. Is this your life? Your School? Be a part of one amazing day—TGIF. Regular Single Ticket price: $12. Subscriber price: $10. All seats will be General Seating. Direct from Australia, the international sensation! Experience classic storytelling up close and personal with Terrapin Puppet Theatre. A unique and highly inventive use of space, objects, sounds and puppetry to create the most ingeniously told seafaring adventure ever. Regular Single Ticket price: $22-$40. Subscriber price: $22 for Section A and $16 for Section B. Credits: Pinkalicious, The Musical Artwork by Victoria Kann; Junie B. In Jingle Bells, Batman Smells! 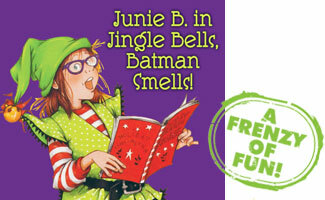 Illustration © 2005 by Denise Brunkus, from JUNIE B., FIRST GRADER: JINGLE BELLS, BATMAN SMELLS! (P.S. SO DOES MAY.) by Barbara Park, Illustrated by Denise Brunkus. Used by permission of Random House Children’s Books, a division of Random House, Inc.; Goodnight Moon ©1947 by Harper & Row. Text © renewed 1975 by Roberta Brown Rauch. Illustrations ©renewed 1975 by Edith T. Hurd, Clement Hurd, John Thatcher Hurd and George Hellyer, as Trustees of the Edith & Clement Hurd 1982 Trust. Used by permission of HarperCollins Publishers. 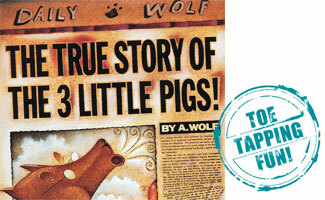 ; A Wrinkle In Time ©1962 by Crosswicks, Ltd.; The True Story of the 3 Little Pigs. Used by permission. ©1989 by Jon Sciezka and Lane Smith. ; All rights reserved.